The manufacturer, Champ’s Mushrooms (Aldergrove, British Columbia, Canada) is warning the public not to consume the Sliced Crimini Mushrooms described below because the product may be contaminated with Listeria monocytogenes bacteria. 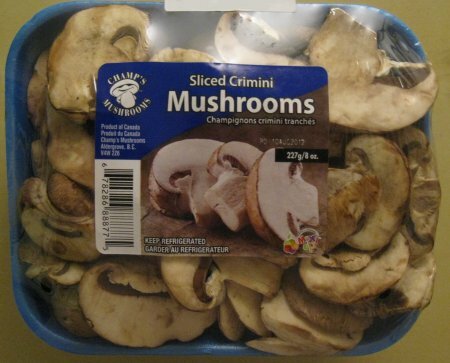 OTTAWA, August 20, 2012 – The Canadian Food Inspection Agency (CFIA) and Champ’s Mushrooms are warning the public not to consume the Sliced Crimini Mushrooms described below because the product may be contaminated with Listeria monocytogenes. The affected product, Champ’s Mushrooms brand Sliced Crimini Mushrooms, Product of Canada, is sold in 227 g (8 oz.) packages. The package bears the UPC 6 78286 88877 5 and the “packed on” date written as, “PO 10AUG2012″. This product has been distributed in British Columbia. OTTAWA, le 20 août 2012– L’Agence canadienne d’inspection des aliments (ACIA) et Champ’s Mushrooms avisent la population de ne pas consommer de champignons crimini tranchés décrits ci-dessous. En effet le produit visé pourrait être contaminé par la bactérie Listeria monocytogenes. Le produit visé, les champignons crimini tranchés de marque Champ’s Mushrooms, un produit du Canada, est vendu en emballages de 227 g (8 oz) portant le CUP 6 78286 88877 5 et la date d’emballage « PO 10AUG2012 ». Le produit a été distribué en Colombie-Britannique. Previous Previous post: Please Save the Great Barrier Reef Ecosystem: Stop Great Barrier Coal!